We soon found a variety of wildlife during a visit to the Royal Horticultural Society garden at Wisley, in Surrey, on Sunday, June 4th. 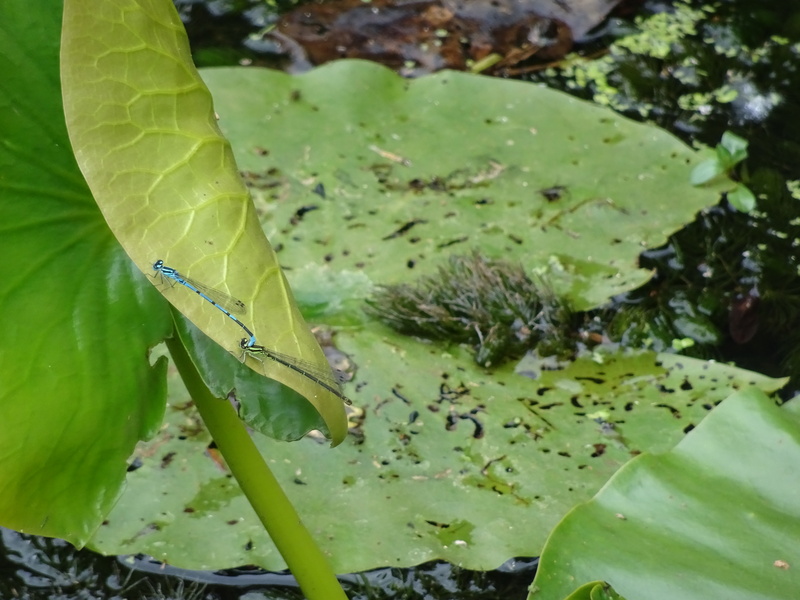 Shortly after arrival at the prestigious garden, we saw a damselfly on a lily pad in a large pond. Then, a blur of wings alerted me to a small bird as it landed on a wall enclosing an adjoining section of built-up pond. It was a pied wagtail, which we soon discovered was one of, I assume, a family group living at Wisley. We saw them several times while we ate our sandwiches and I was amazed at how quickly they can run along. One of the pied wagtails. A male blackbird was gathering titbits for his young from among the grass and a robin came hunting for crumbs. The robin…. obeying the sign. A big highlight was seeing several beautiful deep blue male banded demoiselles fluttering butterfly-like around plants along the waterways. They occasionally perched for photographs. There are some of these demoiselles – the largest of the damselflies – on the River Gaywood, here, in King’s Lynn. There is a second demoiselle in the corner. We also spotted a pair of azure damselflies resting on a plant. A real treat. A pair of azure damselflies. It was a day of sunny spells and breezey. As our coach neared home turf in the evening, the beginnings of a shower resulted in a rainbow to finish our colourful day.